We will be conducting maintenance on the Kajeet Sentinel® platform this Saturday, April 13, 2019, from 2:00 a.m. EDT to 6:00 a.m. EDT. This maintenance event will include an upgrade to our web filtering platform, introducing more granular category control and a simpler, more streamlined user interface. During portions of this maintenance window, student SmartSpot® and SmartBus™ devices will lose Internet connectivity as we complete the upgrade. Steps have been taken to minimize the amount of work within the window, keeping actual downtime to a minimum. To reduce the risk of changes being made during the upgrade and not applying correctly, the Sentinel platform will not be available during the upgrade. We apologize for the inconvenience that this may cause and thank you for your patience. The SmartSpot may be borrowed at thirteen locations: Accokeek, Beltsville, Bladensburg, Fairmount Heights, Glenarden, Hillcrest Heights, Hyattsville, Largo-Kettering, New Carrollton, Oxon Hill, Spauldings, Surratts Clinton and Upper Marlboro. The device is for educational purposes only. It is intended to help children without internet access to have use of the internet through a managed WiFi connection. The device is filtered and restricted to educational use only. The device is operational from 6:00 AM to 1:00 AM. Customers must present their library card and a valid (not expired) photo ID to the circulation staff. At the time of check-out, the customer shall complete and sign a loan agreement. Once a SmartSpot is checked out to the customer, it becomes the responsibility of the customer. Device must be returned to the original borrowing location. Device will be loaned for a period of 9 weeks, no reserves or renewals. Device will be disabled after 5 days overdue. SmartSpots are available in Accokeek, Beltsville, Bladensburg, Fairmount Heights, Glenarden, Hillcrest Heights, Hyattsville, Largo-Kettering, New Carrollton, Oxon Hill, Spauldings, Surratts Clinton and Upper Marlboro. on a first come, first served basis from open to close. Is it between the hours of 6AM and 1AM? Call your branch if more information is needed. See back for branch telephone numbers or visit our website www.pgcmls.info click on Services then Educational SmartSpots. Kajeet SmartSpot 800 - Quick Start Guide. 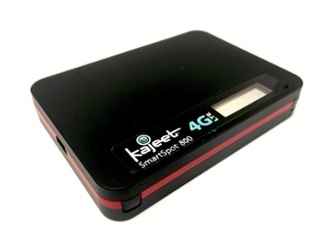 The Kajeet SmartSpot 4G LTE is a portable WiFi hotspot that extends the school day by providing the fastest, filtered broadband access anywhere. Status Display: Provides connection and the battery status, network signal strength, and the number of users connected to the Kajeet SmartSpot 4G LTE. Power/Menu Button: Powers the Kajeet SmartSpot 4G LTE on and off, wakes the screen from sleep mode, and cycles through menu options. Charging Port: The AC charger connects here. To access your WiFi name and password please follow the steps below. Make sure the Kajeet SmartSpot 4G LTE is turned on. With the display on, press the power/menu button once to enter the menu (if the screen is off, press the power/menu button to exit sleep mode). Press the power/menu button again to display the WiFi name. Press the power/menu button one more time to display the WiFi password. Return to the home screen, press the power/menu button two more times. Use the power button to scroll to the WiFi name and password. On your device, turn on the WiFi and select Kajeet Smart Spot WiFi Network name "Ellipsis Jetpack ####" from the list of available WiFi networks. When prompted, put your WiFi password and click OK. Your device is now connected to the internet. Make sure your device is charged (right of Kajeet Status Display Screen). Make sure your Kajeet Smart Spot is having solid Network Signals (left of Kajeet Status Display Screen). Make sure you plug-in the charging cable properly into the charging port. For any other issue please contact any of the branches below.